Historically an endurance hound like its Irish Wolfhound ancestor, the Dogo Argentino (Dogo’s) was expected to track wild boar across vast pampas then corner and hold the animal for the hunters. After cornering the boar, these dogs reserve enough strength to attack and hold the wild animal, which can weigh up to 400 pounds. Additionally, this breed is capable of incredible bursts of speed for short distances but can also cover long distances at a gallop. Their bodies are slightly longer than they are tall and females tend to be somewhat longer than males. As a large, white, smooth coated animal, the Dogo gives an appearance of power. These dogs have a mostly square, slightly domed skull that features a large black nose, which may have a dash of pink in it. Their ears are naturally dropped but, for show, can be cropped. Despite the fierce look of the Dogo Argentino, they are very affectionate with friends and family and are good with children. They are intelligent, highly trainable and love to be the center of attention. These dogs have a friendly demeanor masked by their appearance and are a reliable family guardian that enjoys family guests and are interested in many activities. Unwelcome guests should take caution not to approach this breed since Dogos are very protective and good at guarding. If the Dogo senses a direct threat to any family member, they will act to protect that person. This sense of protection and love is shown also by the Dogos craving for close physical contact with their people. The common saying goes, a Dogo Argentino never lays at your feet, they lay on your feet. A Dogo Argentino will be kept quiet and content for hours by a warm body and soft couch. The Dogo Argentino loves human companionship and longs to be with their owners every step of the way. As young pups, they are inquisitive and will keep busy by investigating everything but grow to be not hyperactive adults. This breed is reliable, protective and friendly toward friends and family. They are good with children and can also make excellent game hunting partners. As intelligent, trainable and trustworthy dogs, they make excellent and faithful guide dogs for the blind. They are also docile and very good guardians who love to show affection and be the center of attention. They do make good guard dogs due to their powerful, loyal and courageous nature. Dogos are initially wary of strangers and even though they have been bred down to be non-aggressive pack hunters, prospective owners should know that they were originally bred to attack unwelcome guests. Some strains of this breed in Argentina are still bred for aggressiveness, so they can be entered in dog fights. These lines are smaller in size, ranging from 75-90 lbs. and are not suitable for hunting or for families. Seek reputable Argentine Dogo breeders for the regular Dogos that are protective of their space yet loyal to owners. This breed makes an excellent and endless playmate both with lasting stamina and a long life expectancy. 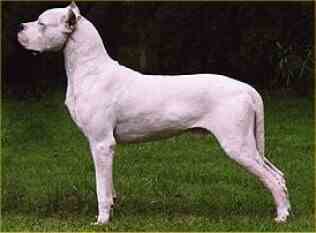 The Dogo Argentino needs a dominant owner to lead and love them. As a clean house dog, the Dogo Argentino needs little coat care. A rubber curry is recommended for once a week grooming to keep the coat and skin in good condition. When bathing, use only gentle shampoos or ones that are made for white coats. When outside for long periods of time, Dogos prefer environments that provide shaded options since their skin can be sensitive to sunburns. About 10% of Dogo Argentinos are born deaf as a result of their white color. Beyond this, other health concerns may include hip dysplasia and sunburn. When given the chance, Dogos are an energetic breed. A mature Dogo Argentino requires regular exercise in order to maintain their muscle structure. As with most breeds, training for Dogos should take place at puppyhood. These dogs are natural healers who respond well to positive reinforcement and motivation training. Dogos will work to please their owners and enjoy receiving approval. Conversely, they do not do well with force training and may be stubborn towards a forceful attitude. Dogos can be trained for tracking, search & rescue, bomb detection, drug detection, as support dogs, as police dogs, as therapy dogs and similar occupations.